Where is it organized: Organized by the State Tourism and Art & Culture Departments, Hornbill Festival is organized at Naga Heritage Village Kisama. Kisama is some 12km from Kohima, the capital of Nagaland. When is it organized: Hornbill Festival is organized over a period of seven days every year in the first week of December. Highlights: All tribes of Nagaland participate in Hornbill Festival. Inter-tribal interaction is on high and cultural panorama of complete Nagaland is on display. Visitors can enjoy the food, songs, dances and customs of Nagaland. Fashion shows, beauty contests, traditional archery competitions, traditional Naga wrestling, and musical concerts also take place during the Festival. Description: Nagaland has a number of tribes and all of them have their own distinct festivals. To encourage more inter-tribal interactions and expose the cultural highlights of Ngaland worldwide, the government started Hornbill Festival in 2000 AD. The government wanted to protect the rich culture of Nagaland and make it presentable to the world so as to attract visitors. Since 2000, when the festival started, the Festival has gained in prominence and attracts tourists not only from all over India but from all over the world. Participation by all tribes of Nagaland is compulsory in the Festival. The Festival is named after hornbill bird – a beautiful bird found in Nagaland and much revered by the locals. Folk stories if almost all tribes have stories showing the qualities of hornbill. The Festival does see beauty contests, souvenir stalls, food stalls, herbal medicine stalls, and other competitions involving traditional games. But along with these there are stalls selling traditional paintings, wooden carvings and sculptures. Day 1: Dimapur – Khonoma: Arrive at Dimapur Airport and proceed to Khonoma village straight from there. There are connecting flights through Kolkata from all major airports, whether New Delhi, Mumbai or Bangalore. Khonoma village, a drive of two hours from the airport, is a historic Angami tribal village where these tribals fought two wars against the British in the 19th century. Guests can easily spot megalith monuments in the village. Have a traditional Angami tribal special dinner. Overnight in Khonoma at a village homestay. Day 2: Khonoma: Enjoy the beauty the nature has endowed on Khonoma. Khonoma was also one of the first villages to put a ban on hunting and logging long before others were not even aware of ecotourism. Khonoma residents launched ‘Green Khonoma’ mission and created a model village beautiful enough to draw tourists from outside. Trek to Khonoma Nature Conservation and Tragopan Sanctuary. This is managed by the village only and this houses the rare Blyth’s Tragopan, a pheasant indigenous to this area. Enjoy the beauty of this sanctuary and also trek to nearby villages. Overnight in Khonoma. Day 3: Khonoma – Kohima: Check out from the village homestay in Khonoma after breakfast and drive around two hours to reach Kohima, the capital of Nagaland. Check into a hotel on arrival in Kohima. 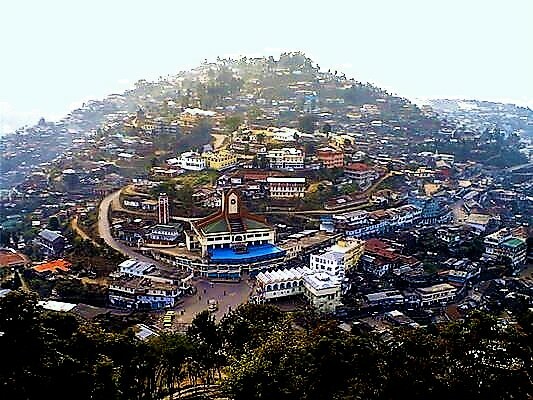 Go out to explore Kohima city. Kohima was one of the places which witnessed fights during World War II. This is why you can see World War II Memorial. This museum not only displays the things from world war times, but also displays art and crafts works, and other historical and cultural aspects of Nagaland. Later, pay a visit to Kohima War Cemetery. Several of those who died during the World War II are buried. Go and take a walk in the local markets. Have a lovely Naga dinner. Overnight in Kohima. Day 4: Kohima – Kisama Heritage Village: After breakfast check out from the hotel in Kohima and drive to Kisama, the place where Hornbill Festival takes place. Check into a hotel in Kisama. Be a witness and participant at the Hornbill Festival. In the afternoon take a walk in the traditional Naga villages. Overnight in Kisama. Day 5: Kisama: Enjoy whole day in Kisama. The festival is at its peak. Experience the energy and experience one of the biggest cultural bonanzas. Overnight in Kisama. Day 6: Kisama – Mokokchung: Check out from the hotel after breakfast and after enjoying two lovely days at the Festival. Proceed for the hill town of Mokokchung, home to Ao Nagas. This is a long drive of more than seven hours. On the way, go and visit Rengma tribal village. You can interact with them and spend some time visiting their houses. Check into a basic hotel in Mokochung on reaching there. Enjoy a delicious dinner. Overnight in Mokochung. Day 7: Mokokchung: After breakfast go out and explore various Ao tribal villages. Visit villages like Impur, Mopungchuket, and Aliba. See the lives of these tribals from close quarters. Make a visit to Ungma, the largest Ao village. Experience their customs and traditions and enjoy their meals. Have a nice Ao style dinner. Overnight in Mokokchung. Day 8: Mokokchung – Jorhat: After breakfast drive to Jorhat, a major tea growing area in Assam. This is a drive of around six hours. On arrival, check into a hotel in Jorhat. If time permits, go on to visit a tea garden and see tea processing on your own. Have a nice and delicious dinner of your choice. Overnight in Jorhat. Day 9: Jorhat – Kaziranga: After breakfast drive to Kaziranga National Park. This is a drive of around two hours. Check into a resort on arrival in Kaziranga. Have lunch in the afternoon and after a brief rest go for the afternoon jeep safari of the national park. Look out for the one horned rhinos in the park. This is what has made this park famous world over. Return in the evening. Have dinner. Overnight at the resort in Kaziranga. Return to the resort, get fresh and have a nice breakfast. Check out from the resort afterwards, and drive to Guwahati. This is a drive of around five hours from Kaziranga. Check into a hotel on arrival in Guwahati. You can take a walk in the local market. Or else, take rest after enjoying a nice dinner. Day 11: Guwahati – Onward Destination: If you are willing, get up early in the morning and visit the famous Kamakhya Temple. Return, have breakfast, relax for some time and check out from the hotel. Drive to the airport and catch a direct or a connecting flight for your desired destination.